The ALN gained widespread business, popular, and church support by promising francophones both control of a modern Quebec economy and preservation of the traditional social order. As Dirks shows, however, this support came from people with different and sometimes contradictory objectives, causing internal tensions which weakened the ALN from the outset. This weakness was compounded by poor leadership, financial difficulties, and the tactics of the other political parties in Quebec. The Quebec Liberal and Conservative Parties worked independently to undermine the ALN and any possibility of its gaining power in Quebec. Maurice Duplessis, leader of the Quebec Conservative party, skilfully exploited the ALN's weaknesses in the interests of his own party by the formation of the Union Nationale. This coalition of the ALN and the provincial Conservatives capitalized on the popularity of the ALN to win the provincial election of 1935 but ensured that power remained in the hands of what was essentially the Quebec Conservative Party. Dirks' insight into the political history of Quebec is informed by a multitude of sources. She conducted interviews with many of the leading political players of the time, including the late Paul Gouin, the original leader of the ALN. She also consulted many public and private archives, including Gouin's, and was allowed unrestricted access to Duplessis' papers for the period up to 1939, the year the ALN ceased to exist. 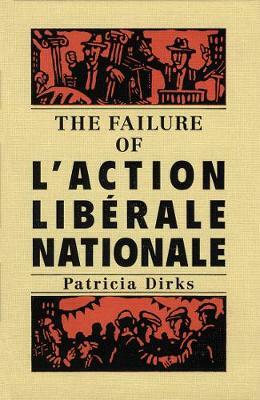 In relating the rise and fall of the ALN to the socio-economic, ideological, and political developments which shaped Quebec during the early decades of the twentieth century, Dirks reveals its long-term impact on the operation and organization of political parties in Quebec and Canada.